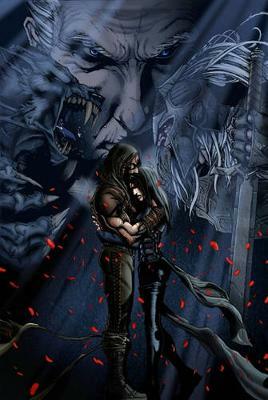 Underworld screenwriter and actor Kevin Grevioux pens a special two-part adaptation to the upcoming big-screen bonanza - The origin of Lucian and the untold story behind the age-old war between the Lycans and the Vampires! Sonja, daughter of the Vampire King, is a respected member of the Council of Vampires. But what happens when this Vampire of royal blood falls in love with Lucian, the very first Lycan werewolf and a slave? Will their forbidden love survive or will it destroy them both? The story continues as Lucian and his new found ally, Raze, lead the werewolf revolt against the Vampires. But are their captors too powerful and too numerous to overcome? Meanwhile, Sonja does what she can to ensure the success of the Lycan insurrection, but will she doom herself by trying? And will Viktor find out about Sonja and Lucian meaning death for them both? The dawn of a new era of Lycan freedom is on the horizon!